It seems fitting that after my time spent at the Biodiversity Research Centre (BRC) as a graduate student of Zoology, I should find myself immersed in a new project whose primary aim is to quantify and explore biodiversity in nearshore marine habitats. It seems fitting that after my time spent at the Biodiversity Research Centre (BRC) as a graduate student of Zoology, I should find myself immersed in a new project whose primary aim is to quantify and explore biodiversity in nearshore marine habitats. And this is not just any run-of-the-mill project, this is a brand new global initiative administered by the Smithsonian Institution through the Tennenbaum Marine Observatories Network. The project is called MarineGEO and it is both exciting and inspiring in scope. By collaborating with other institutions and researchers, it promises to be the very first worldwide biodiversity monitoring network of our coastal waters. MarineGEO will combine coordinated observational and experimental techniques to answer fundamental questions about the role of biodiversity, both its impacts and its origins, in shaping the world around us. I was recently hired as a biologist and technician with the program based out of the Smithsonian Environmental Research Center (SERC). My role is to coordinate field operations with all MarineGEO partner sites, develop monitoring and experimental methodologies, and serve as a central point of contact for all other MarineGEO technicians. The inner portions of mangrove islands in the area are dominated by dwarf growth-type trees. Though small, they can be hundreds of years old. I was lucky enough to be a part of one of the first MarineGEO expeditions at the Smithsonian’s Caribbean Coral Reef Ecosystems (CCRE) station in Carrie Bow Cay, Belize this February. Situated on a tiny island barely big enough for the three buildings that stand on it, you’d think you’d washed up on the shore of Gilligan’s Island. In fact, Carrie Bow can only support six scientists and three staff at any one time! Luckily I was able to make my way onto the research team headed by Dr. Ilka “Candy” Feller, one of the foremost authorities on mangrove ecosystems. We are here to monitor and sample the local mangrove wetlands, a brief 20 minute boat ride from Carrie Bow, that Candy and her group have been tracking for the past 15 years. The data we collect here will form a vital part of MarineGEO’s data repository, a repository which will eventually include seagrass, coral reef, soft bottom, and kelp forest biodiversity measurements, just to name a few. Many marine creatures including fish and anemones thrive around submerged mangrove roots. I am new to the mangrove ecosystem, having spent most of my time at the BRC studying invertebrate communities in seagrass meadows of BC. 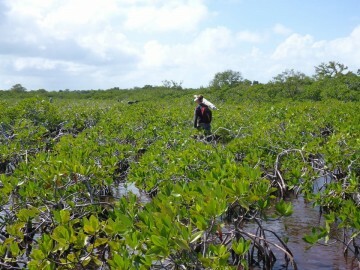 Luckily, many of the techniques associated with seagrass sampling translate well to working with mangroves. As we stepped off the boat and I got my first glimpse of a mangrove wetland, I was struck by the sheer number of creatures that called the mangroves home. Snorkeling around the roots of the trees, every turn showed me something I had never seen before. 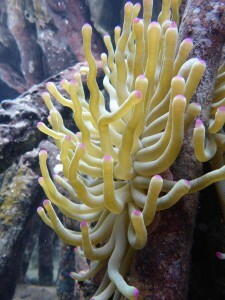 From tubeworms and urchins to anemones and manatees, life was positively brimming out of the water. The mangroves of Belize are an important part of the marine ecosystem and they face constant threats from development and pollution. While beautiful, the landscape is frequently marred by dredging operations and plastic debris. That is why the work of Candy Feller and the MarineGEO team is important. By drawing attention to the role of biodiversity in maintaining healthy ecosystems, we can better educate decision makers and stake-holders that rely upon the services that mangroves and other marine habitats provide. MarineGEO is in its infancy, but we have already partnered with five research stations on the east coast of North & Central America and Hawaii, with plans to soon expand to San Francisco and the central coast of British Columbia. We hope these will be the first successful steps toward realizing a global initiative that will teach us what biodiversity really means. 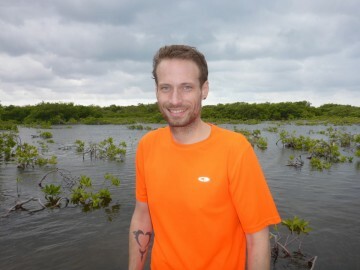 Author Ross Whippo one one of Belize’s many mangrove islands.